Size 1/4 in., 1/2 in., 5/8 in. 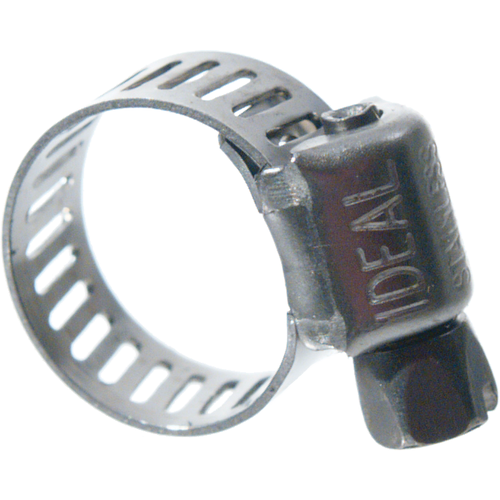 These Stainless Steel small hose clamps are perfect to keep around as your go-to clamp. Use them anywhere you want to be sure your tubing will stay connected. They are perfect for silicone hoses and hooking up quick disconnects, pumps, or on any system that may need a tight seal. These stainless clamps tighten up better than cheaper ones, and the stainless steel won’t corrode. It’s handy to keep a few spares around, just in case. Our small clamps will fit hoses with 3/16" through 5/8" OD. Thought I might need it for Robobrew chiller. Extra careful to make sure the fittings are snug. Can't seem to ever have enough of these to stop gas or fluid leaks that spring up. Spares for future small hoses. Hi, just wanted to make sure this clamp would fit a 3/16" OUTER DIAMETER hose? Thanks! Will this fit on 3/8” reinforced silicone tubing? BEST ANSWER: Hello Andrew - Yes, these will fit. It clamps hoses. Not much else to say. Broke after a few uses, and tears up the tubing. Worked just fine for splicing in a flow control in my 3/16 ID line. While it's hard to get too excited about a hose clamp, these are higher quality than the ones I bought at a hardware store. A good idea to keep a few of these around. Don't over tighten. But get back ups. Sometimes when you loosen it the screw gets messed up and you can't use it again. These really do tighten snug better than the cheap ones. I use them on all my high pressure and high temp hoses for ease of mind. Perfect for silicone hoses and hooking up quick disconnects, pumps, etc. What else can you ask for? Would recommend! I use these for all my liquid transfer or gas systems than may need a tight seal. They clamp down very easy and are super durable. I would rather buy these in bulk someone else. But good to buy one or two for a pinch. I have tried going cheap on hose clamps because I didn't think there was a difference, but the cheap ones never tighten up all the way before they start spinning. These tighten up really well, so even though it's a small part you never think about, quality really comes through with these.